Attending high-quality childcare and preschool can have lasting positive impact on children who might otherwise face stumbling blocks on the path to school readiness, academic success, and a productive life. But for many families in the U.S., high-quality care is too expensive,1 has too long a wait-list, or is difficult to find.2 National data shows that millions of low-income birth to five year olds are not being served in any center-based childcare, nursery, or preschool, quality not withstanding.3 Improving the affordability and accessibility of high-quality care opens the door to a lifetime of potential for these vulnerable children. Increase access to high-quality early education programs tailored to meet the needs of disadvantaged children in the neighborhoods where their families live and/or work. Educare™ provides full-day, full-year schooling for low-income children from birth to age five. The first Educare school opened in Chicago in 2000, and 19 more Educare sites have since opened in high-need communities across the U.S. Each school serves 140 – 200 children. 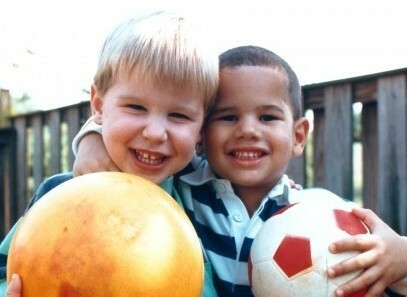 Although there is some local variation, all Educare schools adhere to a basic set of core practices to ensure quality. Schools also receive assistance and training through the national Educare network for ongoing improvements of their own local programs and services. Evidence shows that Educare participation can narrow, or in some cases close, the achievement gap for disadvantaged children in measures of vocabulary, school readiness, and social emotional skills. In the long term, early success in these areas has been linked to lower rates of high school dropout, behavior issues, crime, and unemployment, among other outcomes. Greater and sustained family involvement in children’s schooling. Preliminary results from the Chicago follow-up study found that teachers rated two-thirds of Educare parents as being either equally or more involved in their children’s schooling than other parents. Increased quality standards in teaching and education outcomes by training early learning professionals in teaching methods and practices. For example, Educare of Denver shares a campus with the Clayton Institute and Training Center, and serves as a demonstration site for teacher education, leadership development, parent engagement, and program evaluation to improve the quality of early childhood services throughout Colorado. Increased philanthropic, governmental and corporate investment in early learning. Educare has been actively involved in a range of successful advocacy efforts to increase or protect public funding for early childhood programming. In Oklahoma, for example, Educare Tulsa inspired the creation of the Oklahoma Early Childhood Program, an innovative funding mechanism to provide more services to at-risk infants, toddlers and their families throughout the state. Consistent with Educare’s model of private dollars maximizing the impact of public spending, OECP is funded with $10 million of public funds and $15 million of private funds. One-time construction costs for an Educare facility range from $8 to $12 million, depending on the location and other factors. Educare is funded through public-private partnerships, with philanthropic dollars covering most of the construction costs and public funding of various types (the largest portion being from Head Start) covering approximately 80% of ongoing operational costs. An additional child can receive Educare for a philanthropic cost of between $4,000 and $20,000, depending on how many years that child attends the program. Evidence indicates that the longer a child participates in Educare, the stronger the outcomes will be. Short-term: Educare students score at or very close to the national mean on tests of school readiness, vocabulary, and social/emotional skills. Educare graduates are scoring on these measures as if they had no risk factors. Mid-term: Educare students surpass their peers with fewer risk factors on district and state level standardized tests for reading and math. 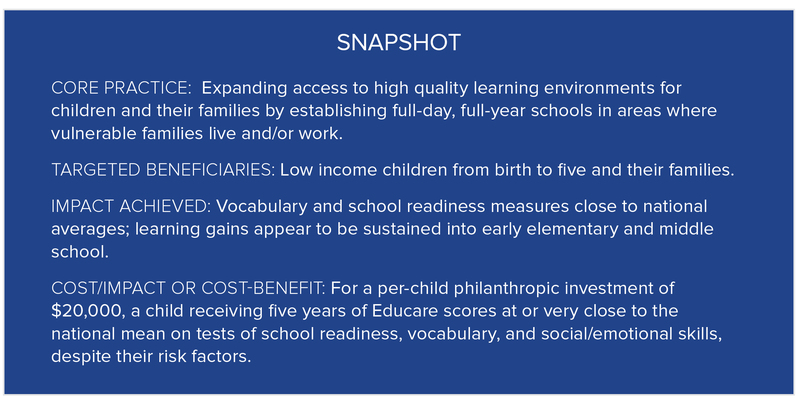 Long-term: Based on evidence from similar high-quality early childhood programs, Educare students may see better health, an increase in school achievement and income, and a decrease in unemployment. For more information on the Center’s approach to calculating cost per impact, click here. Take Action: Use this online mapping tool to locate current Educare programs and their local implementing partners, or contact Educare’s national partners: the Ounce of Prevention Fund and the Buffett Early Childhood Fund. Click here for suggestions of other programs that provide kids with great places to learn. 9 Magnuson, K.A., Ruhm, C. & Waldfogel, J. (2007). The persistence of preschool effects: Do subsequent classroom experiences matter? Early Childhood Research Quarterly 22, 18-38. 10 Ounce of Prevention, slides on Chicago follow-up study. Retrieved 2/09/14 at: https://www.ounceofprevention.org/research/pdfs/Followup-Study-Presentation-20130206.pdf. 11 St. Clair, L. (n.d.) Munroe-Meyer Institute, University of Nebraska Medical Center. Educare of Omaha Information Brief: Educare of Omaha School Age Follow-up Study. Unpublished evaluation provided by Educare. (Educare of Omaha average=111; school district average for children eligible for free and reduced lunch=85). They also outperformed the state proficiency standard of 86 points. 12 Ibid. Educare and FPG have launched a longitudinal random control study to examine program effectiveness and impact by assessing child development and parent-child interactions of 239 infants and their families from birth to age three. 13 Karoly, L.A., Kilburn, MR, Cannon, J.S. (2005). Early childhood interventions: Proven Results, Future Promise. RAND. 14 The average per-child (all-in, full-day, year-round) operating cost for Educare is about $20,000, ranging from $17,000 to $25,000. Because 80% of this cost (around $16,000) is covered through government funding streams (Head Start, Early Head Start, child care subsidies and preschool funding), however, the additional per-child philanthropic contribution to Educare’s model is around $4,000 for a single year, or $20,000 for all five. This contribution can be considered Educare’s quality add-on to a “regular” Head Start/Early Head start program.